While I’ve always been interested in toys that were educational as well as fun, having a developmentally delayed autistic child has spurred my interest in finding toys that help both of my children build necessary skills. Unfortunately, a lot of the general toy lists I’ve seen online suggest items which can inhibit skills, while the special needs lists often contain toys that my boys find boring. I wrote these lists to help parents find toys that kids generally love and will build developmental skills including gross motor, fine motor, imagination, and communication/speech. I acquired them off of recommendations from books and therapists, as well as suggestions from my friends. To help parents find the perfect items for their children I’ve divided these lists up by skill category and age. Since my boys just recently turned 3, the age categories I cover are toddler and preschool, although I plan to expand as my boys get older. You can find the toddler version here. I’ll be adding to this preschool list as my boys grow and we have more time to try out various toys and suggestions. I’ll only recommend items that we personally enjoy and play with frequently. For ease of shopping convenience for busy parents, I provide amazon affiliate links, but most of my items I’ve obtained through sales such as consignment and yard. One of my favorite things to do is to visit craft stores immediately after the holidays. You can pick up seasonal versions of your favorite craft items at great prices. There are way too many items to list all of them. For each category, I’ll give general ideas as well as pick out our absolute favorites. A lot of these toys, like art supplies, really belong in multiple categories, so I just picked one for simplicity sake. Gross motor toys are those that get your child moving! General ideas are swings, slides, play climber /house , trampoline, Basketball Set , kick balls, bowling set , Cozy Coupe , Bubble Mower, Sand & Water Table, gardening and digging tools, hopper or peanut ball etc. Unfortunately, I can’t find a copy of our play tunnel online, but it’s similar to this pop-up tunnel . A tunnel is great way to encourage crawling, which is amazing for helping children develop good core strength and giving the brain a nice workout. Having children climb up slides is another fun way to encourage movement on all 4s, but that can be confusing to some children who will have trouble understanding why they can go up at some times, but not others. A tunnel is my absolute favorite way to encourage crawling followed closely by pretending to be various animals. Connect the tunnel to homemade forts or a play tent for extra exploration. Another fun thing to do with a pop up tunnel is to build communication through a game I like to play with my boys called “pop up”. I hold the collapsed tunnel on the floor and have the boys step into the circle one at a time. We count to 3 and then, to encourage joint attention, I make a silly face and say “Pop!” in a silly voice while releasing the tunnel so that it shoots straight up and covers the boy. They collapse inside the tunnel and wiggle around like worms giggling. At around 3, most children can start transitioning to a bike with pedals, although those with gross motor delays might need more time with a balance bike or a push pedal car . On the advice of my son’s physical therapist, we took him to a store and let him try out a few bikes in person before we settled on the Radio Flyer Red Rider Trike , mostly because red is my son’s favorite color. 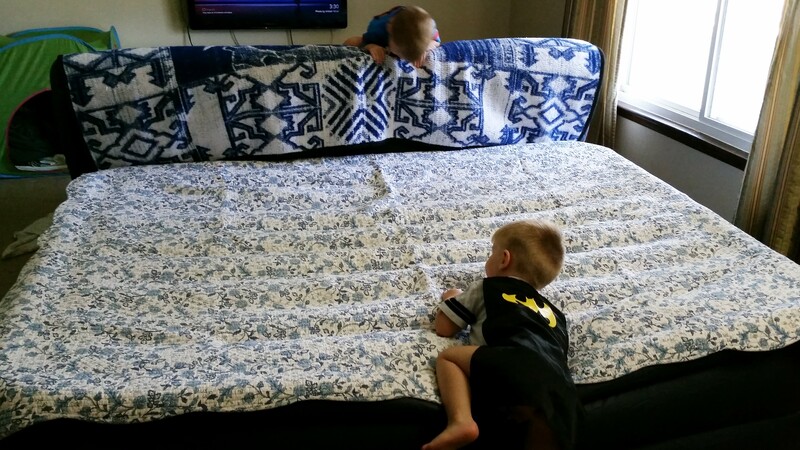 Since bounce houses can get quite expensive and we didn’t want to deal with an outdoor trampoline, we bought an inflatable bed and use that for our large sized trampoline. We have the Intex Raised Downy Airbed, which has held up remarkably well with two preschoolers bouncing on it frequently, although we no longer use it as a guest bed since it doesn’t hold hair long term like it used to. There are a lot of fun games you can play with a large bed like this. We throw Bean Bags across the bed at each other. I pull the bed away from the couch a bit and crawl around the bed singing the “5 little monkeys/crocodile” song [youtube video] before jumping up and snatching one of the ‘monkeys’ off the ‘tree’. No bells or whistles, and my one son got bored of it easily, but cute and very easy to use and my other son likes it a lot. This looks to have more long term potential for both boys and my one son is obsessed with musical instruments, so he was highly motivated to play. The mark against this board is that it has to be on a particular surface. It seems to work best outside on concrete and not very well on carpet. It also requires a firmer touch than my one son naturally applies, so we had to help him press the items to learn how to use the toy. Once he figured out how it worked, then he wanted to sit on the floor and play with it more than stand on it. We do still like it and use it, but we try to use it supervised. In addition to crawling and balancing, walking up and down stairs is a great way to build core strength. 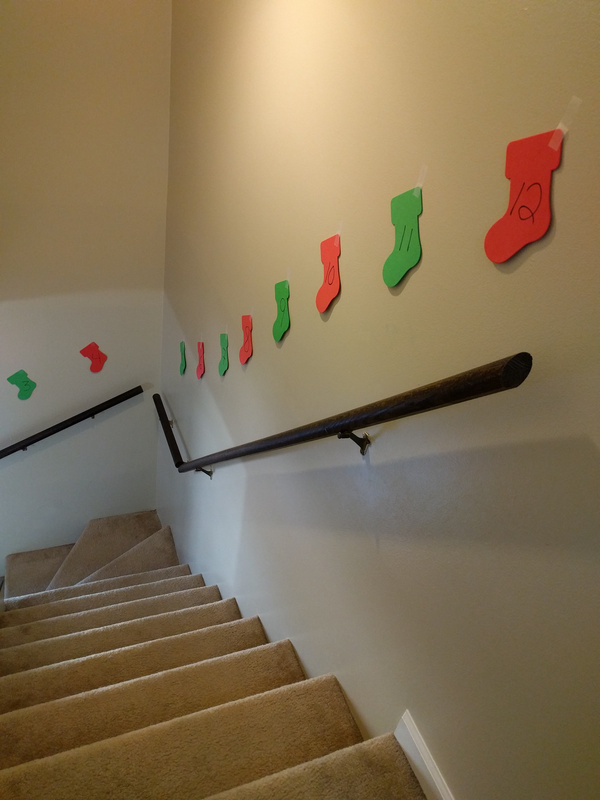 Unlike a lot of parents, I actually encourage my boys to play on the stairs and I do that by putting numbered decorations above each stair. I like to purchase foam craft pieces at the end of each season when they are on discount. You can also use construction paper. You can make this into a fun matching game using whatever you want to use – numbers, letters, colors, shapes, etc. I like numbers because I count with my boys while going down the steps. When we get to 1, we yell “Blast off!” and jump off the bottom step. General ideas are nesting blocks (this car set is amazing) or cups , hammer and peg , bath toys that stick on the wall (you can make your own with craft foam), wooden blocks, LEGO DUPLO or mega bloks Jr builder (the two are interchangeable), latches board, and lacing cards . 1. Scoopers, tweezers, droppers, scissors. As I mentioned in the toddler post, the fine motor tool set by Learning Resources is a great place to try out a variety of tools. The Handy Scoopers are useful for helping children learn how to use scissors properly. Since my boys mastered the easy droppers, I bought the Eye Droppers. These are not as colorful as the Jumbo Eyedroppers, but I decided to go with the smaller size to better develop the boys’ pincher grip. I’ve found it very helpful to get the Fiskars training scissors, which are designed to pop open by themselves and better teach children how to use scissors properly. We’re moving from the board puzzles to the large floor puzzles. My one son is still not interested in the interlocking piece puzzles, but his twin is fascinated with puzzles like this Melissa & Doug Solar System Floor Puzzle . Lots of things to do with playdough and oozes including working on cutting, rolling into shapes, smashing, building stacks of cubes or balls, etc. There are many recipes if you’d like to make your own. If you go to craft store and supermarkets after the holidays, you can often find Peeps on sale. They make a great edible playdough! 150+ Screen-Free Activities for Kids is a great book with a lot of suggestions for homemade oozes and doughs, many of them taste-safe. My boys are huge fans of repeatedly hiding and uncovering their cars in putty/ooze. Another fun thing to do is to hide small toys and objects in the dough, putty, or ooze for the child to find and remove. It can be a huge pain to make and set up, so busy parents can purchase this set of Discovery Putty, which features a mixture of toys and putty for your children to explore. I admit to a love/hate relationship with our marble run. We got it when the boys were 2 and I do not recommend it at all at that age, especially if your children are still randomly putting things in their mouths. Since my one son still likes to mouth toys, I don’t dare leave him unsupervised with the marble run, which limits the opportunities we have to use it. That being said, if your children are better about this issue, a Marble Run is a great way to work on building skills and a pincher grasp as well as turn taking. A google image search of preprinting skills worksheets reveals a lot of different ways you can work on preprinting skills at home. Print some of the free samples or just make your own. 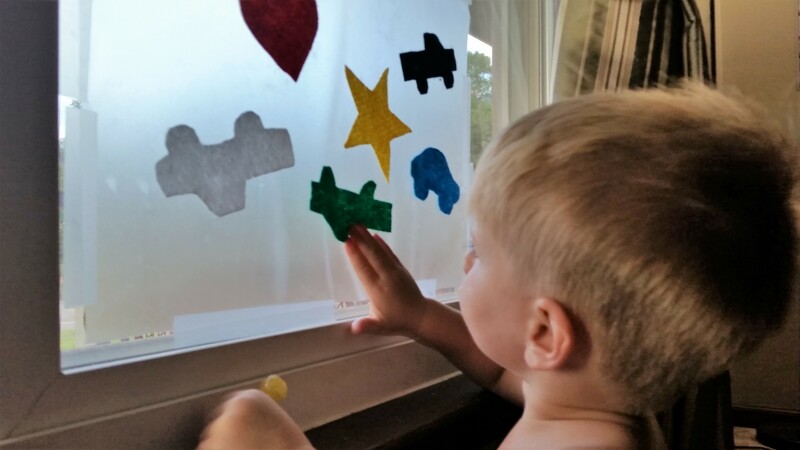 I like to take large stickers of vehicles and draw little ‘roads’ for my boys to trace. You can start with just working on horizontal and vertical strokes, progress to simple shapes, and then move on to letters and numbers. 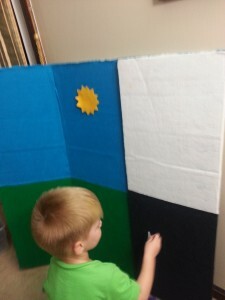 To make it easier for children to practice printing, you can use a standing easel or just tape the sheets to the wall. So many of the toys we love belong in this category. Almost any good toy can be used in imagination play. One of the things I love to do is buy used versions of adult items that the boys seem interested in. For example, my boys have their own toy vacuums as well as an actual small working vacuum , which they love to use. Likewise, they have their own dustpan and broom set , which they also use to clean up real messes. Although they do have a play kitchen well-stocked with play food , I also encourage them to help me cook as much as possible. They even have their own set of slightly smaller colorful kitchen utensils . Because they’ve helped me out in the kitchen or with cleaning, I’ve noticed that they are more likely to incorporate those concepts into their imagination play. General ideas are dolls, stuffed animals, dress up clothing, and pretend profession kits like this doctor set. One thing that’s helped a lot to making grocery shopping with the boys more enjoyable is rehearsing what happens when we shop. I started doing this after my autistic son became really upset in the check out lane. I figured out that he didn’t understand that I was going to get my groceries back after placing them on the conveyor belt. He saw his favorite items moving away and, understandably, became quite upset. This Learning Resources Pretend & Play Calculator Cash Register is a great toy to have on hand in order to rehearse visiting grocery stores, restaurants, shops, and other places where money changes hands. We actually got it when the boys were two, but I don’t recommend it for small children, especially ones that still mouth items. All the coins were lost within the first few weeks of play. I mentioned instruments in the toddler post, but wanted to talk about some instruments I don’t recommend for toddlers, such as these awesome hand bells. They are quite heavy and not for children that will be throwing them about and at each other, but very fun to play. 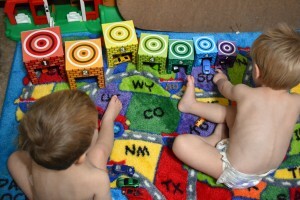 My boys love the bright colors and singing jingle bells all year round. I also purchased this ukulele when it was on sale. I’ve been happy with it because it does exactly what I wanted it to do, although it annoys my husband since he can’t get it properly tuned. My boys don’t seem to mind and I’m no longer worried about my boys trying to put things inside our actual guitar. In the toddler post, I mention squigz , the Learning Resources Gears! Gears! Gears! Super Set , and this Junior Pegboard Set , but there are other great options for preschoolers. These peg sets are less about building pictures and more about building up. I like this set in particular because you can make structures with it. My boys are big on building garages for their cars with their building sets. I asked my friend’s list for their favorite toys for 3 year olds. Magnatiles/playmags was the overwhelming response. We completely understand why now after playing with them for a few months. We ended up with the Playmags, so I don’t know if the Magnatiles are exactly identical, but the general concept is the same for both. We were given the 100 Piece Playmags Set with Car as a birthday gift for the boys and loved it so much I immediately ordered the 50 Piece Set Including Magnetic Cars in part because I didn’t want to have to deal with the boys constantly fighting over the one car. Also, I wanted more pieces. It is a set that requires a bit of finesse at times, so I put it in this section instead of toddlers, although I think there are plenty of skilled 2 year olds who would love it. In addition to buying sets to make vehicles, you can also purchase general building sets like the SmartMax Build XXL . Although we received these sets as a gift shortly before my boys turned 3 and they loved it at that age, I recommend it for 3+ because the certain color magnets only attach to other certain colors and my boys find that a bit confusing. Also, some of the pieces require extra help to snap into place. The story boxes are perfect for toddlers as well, but since the Magnetibooks contain small pieces, I put the whole lot in this section. I love these creative sets! The story boxes are designed so that the outside of the box can be used as a backdrop for play. The Firefighters story box was our introduction to this series. In addition to the fighterfighters, they also have sets featuring City , Circus, Farm , Safari, Far West , and a Princess Palace. Like the story boxes, the Magnetibooks are designed so that the storage box is part of the play. In this case, the lid turns into a board to place your magnets. This is the perfect size to go in my diaper backpack, even with 2 stuffed in there. The Magnetibook Vehicles is what my boys love best. Other options include the alphabet , Crazy Face , and Girl’s Outfits. 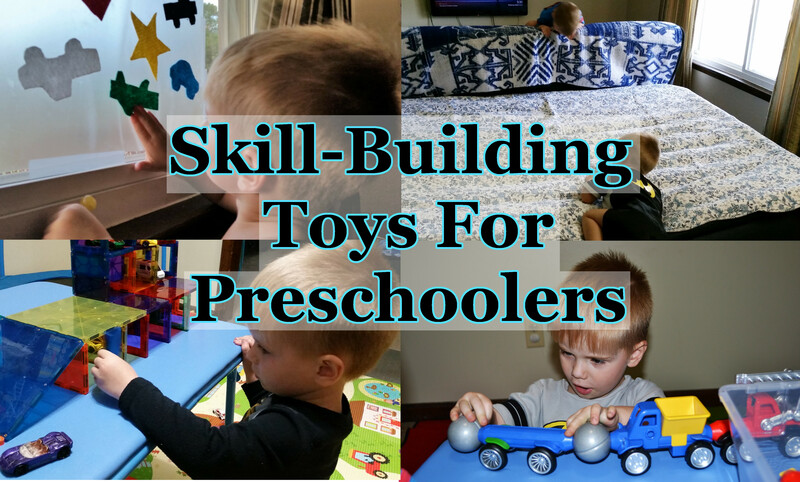 As I explain in this series, as long as you are picking toys that encourage open ended play, it’s not the toys that increase communication, but how you play with toys. Any one of the toys I’ve suggested on this page has built in communication opportunities. That being said, there are special toys and book that have really helped me communicate more with my sons. If you are looking for suggestions for toys and books that help you work on emotional communication, then check out my Tools To Teach Emotions To Toddlers. I had a hard enough time picking out my favorite books for the younger set. I love too many books for preschools to narrow down to just 5! I’ll be posting those recommendations separately with books divided into categories such as holiday, sleep, sharing, and so forth. One thing I highly recommend even for very verbal preschoolers is reading about upcoming events. For major holidays, I include books on that holiday in the box with the decorations. When it’s time to pull out the decorations a few weeks before the day, I bring out the books as well. My boys knew exactly what to expect for Thanksgiving this year, down to what dishes we’d be eating because we talked a lot about it through our Thanksgiving books. I think this helped tremendously for both of my boys being willing to sample almost everything on their plate (no cranberry sauce this year). This is a section I hope to grow over time. My husband and I are huge board game geeks with an ever growing collection. We tried various games with the boys since they turned 2, including Candy Land , which was recommended by friends with children our age, but the boys just weren’t interested in board games at all until the last month. Board games are great for teaching problem solving, strategy, turn taking and patience. Of the games we’ve tried so far, we’ve had the most success with Cootie . My boys were mostly interested in throwing the dice around, but also enjoyed putting their bugs together. I’m also a huge fan of cooperative games for adults and children. Peaceable Kingdom makes a few for small children including Hoot Owl Hoot! I picked the owl one because my boys love owls, but the company also makes board games for preschoolers about dinosaurs , bugs, chickens, as well as lots of options for those 5 and older. What I like about these games is that it doesn’t matter if a sibling loses interest and wanders off in the middle of the game. My sons didn’t seem to fully understand the point of this game, but enjoyed it nonetheless. It does contain a lot of very small pieces. I’m not sure if there is a better name for this type of game, but games such as hopscotch, Simon Says, Duck Duck Goose, Hot Potato, Red Rover, freeze tag, etc, that don’t necessarily need any equipment, but get kids moving and build turn-taking, teamwork, and listening skills. or just draw out the pattern with chalk outside and painter’s tape inside. 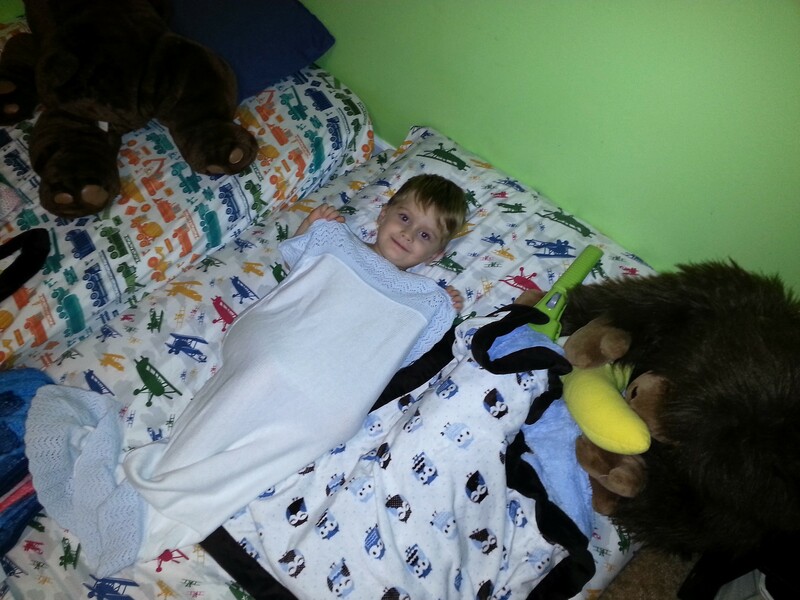 For Hot Potato, you can use these Bean Bags or just a stuffed animal. but mostly I prefer to make stuff at home. One of my boys’ favorite game is one I made up called ‘number hop’. I write 1-20 on the ground and they hop from number to number while I call out the numbers. Simple and easy, but they love it. If your children are like mine, I do not recommend using painter tape indoors to write out the numbers. They were already ripping it up before I managed to put it all down. Instead, I just write out numbers on pieces of paper and tape those down. For children that love to run, playing ‘Freeze’ with colored handkerchiefs purchased at the dollar store can be a great way to get them to pause. Whenever I see one of my sons about to bolt in a parking lot or another situation where I need them to be close, I yell freeze, and they both become statues. I had to put this in both age categories since it really grows with your child. I made mine, but busy parents can purchase various felt play sets . To make mine, I took a large poster board and covered both sides in felt to create two different background scenes. I turned one of the panels in so you can see both sides of the board. Then, I cut out various shapes, numbers, and faces so that we could use the felt board to talk about our emotions. The felt pieces can also be stuck against contact paper facing out on windows to make interesting scenes. Not only great for fine motor skills, you can use the various items, shapes, and faces to discuss all sorts of things and work on various sounds! One thing that’s mentioned a lot in the Early Start Denver Model and Joint Attention Mediated Learning is that your children learns best from you when you enter into their sphere of interest rather trying to bring them into yours. This is true for both autistic children and neurotypical children. We’ve learned to embrace our sons’ interests, even if they are unusual. Since my autistic son loves vacuums, we find ways to incorporate vacuums into our social games. Playing house with his vacuum tucked snuggly in bed. Since they both love cars, we practiced colors by sorting cars. Dive into your children’s interest to build good communication. There are always ways to build shared interest, even with the most unusual obsessions! Note – These haven’t changed from the toddler recommendations. At first, I planned to be one of those zero screen time before 2 parents, especially since that was the recommendation at the time. Then we had to travel out of town for the holidays and then our occupational therapist recommended some apps for helping my son learn to point. Since then, I’ve learned to embrace screen time used appropriately. It’s perfect for long plane or car rides and there actually are a lot of great apps out there with good educational value. If you have android phones and want to earn some money for your apps, you can use Google Opinion Rewards to earn play store credit. That’s how I’ve bought all of our apps. You can get the itunes and android versions here. Kindle Tablet Edition here. I’ve only tried the android version of this because I don’t have credit on itunes, but it was recommended by my son’s occupational therapist. She suggested using it with a stylus, especially a mini stylus. A great way to learn on sick days when they are too tired to move. The app centers around teaching your child how to trace letters, practice horizontal and vertical strokes, and practice accuracy when using a stylus. It also has a free drawing section that you can use as a mess free drawing pad when out and about. 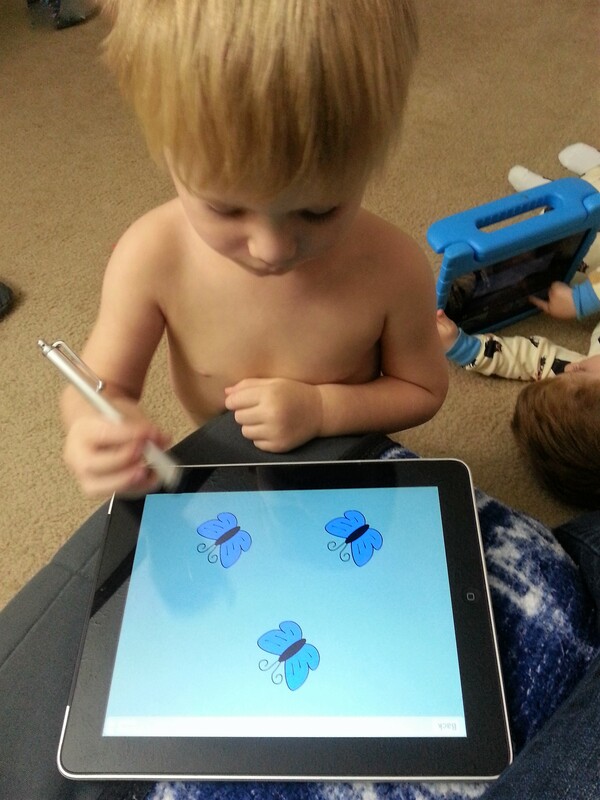 Using a mini stylus is a great way to practice handwriting skills with any of these apps. In the interest of full disclosure, this is my brother’s app, but it’s free! Android version and itunes version. It’s a great app for isolating that pointer finger for children who need help learning how to point. Children with developmental delays often struggle with remembering what to do next in a sequences. When it takes a lot of concentration to do something like put on pajamas, it can be easy to forget what comes next after putting on the pajamas. That’s why I like Daniel Tiger’s Day & Night app. It helps children remember the sequences for getting ready in the morning and at night with songs and easy to follow steps. These apps are pretty simple, but engaging. With Endless Alphabet , you drag letters around to make words. With Endless Numbers, you drag the numbers and press on them to add up digits. Not only do they help teach letters and numbers, but when used with a stylus, it makes great fine motor practice. I’ve only played the Kids ABC Trains Lite version as I haven’t saved up enough credit to purchase the full version, but my boys don’t seem to mind. Like ready to print, you trace various letters, although you drive trains along to trace the letters, which my boys really enjoyed. If your child loves vehicles and trains, this app can be highly motivating. I’d love to hear from you for more toy suggestions. 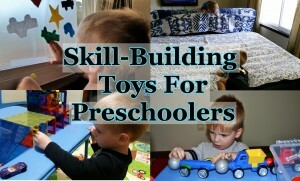 What skill-building toys do your children love?